For horses in medium or hard work. Ideal for showjumping, eventing, dressage or hunting. Light Competition Mix is an increased energy muesli mix with boosted vitamin and mineral levels for performance. Dampen well before feeding. 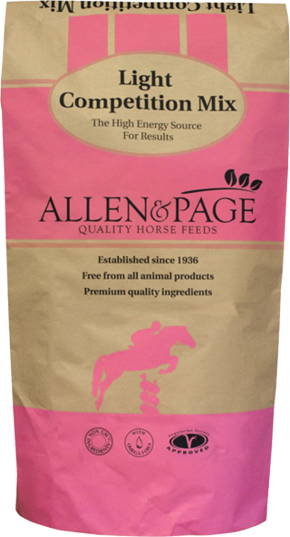 Introduce a new feed gradually over 7 to 10 days building up to the amounts needed to maintain condition and energy levels (0.5 – 5.0kg depending on size, type, workload and condition). 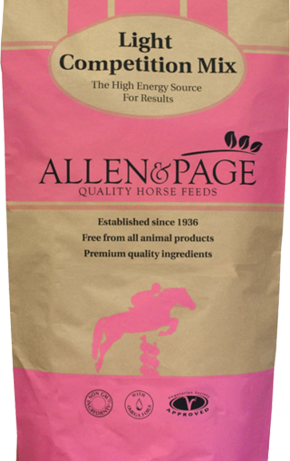 Allen & Page cannot be held responsible for any problem encountered if the feed is not prepared in accordance with our recommendations. This feed should be fed with forage and fresh water. Do not feed to sheep.